The Unlikely Homeschool: "Mom, I Don't Want to Do School Today!" "Mom, I Don't Want to Do School Today!" You plan. Your prepare. You create an epic lesson...the likes of which even Charlotte Mason would applaud. But, instead of a captivated face of interest, you are met with crossed-arms, apathy, and an indifferent sigh passively declaring, "Mom, I don't want to do school today!" You are met with resistance. 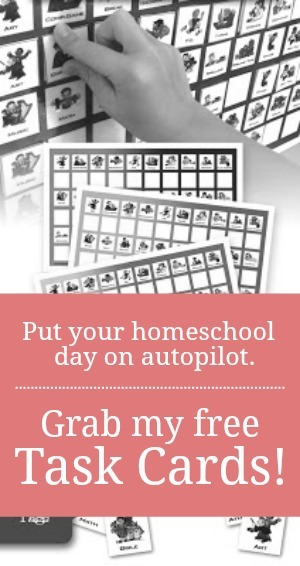 As a homeschool mom, you want nothing more than to ignite a passion for learning in your child. Lately you find, however, that you can barely kindle a spark. You are not alone, dear momma. We've all found ourselves on the receiving end of opposition at one time or another. We've all been faced with a child who just doesn't want to do the work that has been assigned. 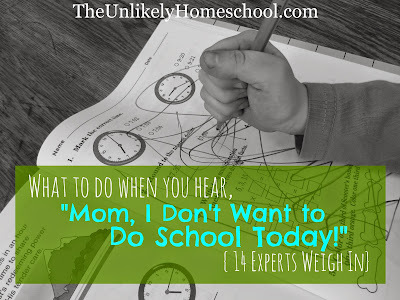 Today, I've asked a few expert homeschooling mommas...fourteen, to be exact...to share their best advice for dealing with a resistant learner. With years of homeschooling under their belts, these mommas want to link arms with you and remind you of one simple truth. "Our children definitely go through stages of being 'resistant' to learning! When I see this happening with my child, I mentally run through a series of questions to help me understand the source of the resistance: Is the assignment above their learning level? Are they being resistant as a way of reacting to something else going on in his or her life (or in our family's life)? Is there a better way (or a different way) that they can still learn the information and build a love of knowledge? Do they need to learn diligence and follow-through and be encouraged to finish the task before them (sometimes offering him/her other motivation or rewards for completing the project)?" "There are some questions that I immediately go to when a child is resisting or refusing to work. Is the child frustrated? Are they tired? Are they having fun? While fun is not always necessary, a child needs to be motivated and understand why they are being asked to do the work. Not a lot of learning actually happens with coercion. Think about all the "stuff" you were forced to learn in school. Most of it was quickly forgotten. But peak their interest, make it fun, make it meaningful and you will have much more success. How is your relationship with the child? Do you find yourselves at odds about other things? Sometimes when the relationship is strained it shows in the area of homeschooling. Work on building a bond. Let them have control over parts of the day (when they do school, where, etc.). Work on compromise and making the home more peaceful." "My eldest often goes through phases where she closes her mind to learning new material because she thinks it will be too hard. When this happens, we usually stop that subject for the day and step back to something easier in that subject the next day to boost her confidence again. A little bit of confidence-boosting works wonders!" "Kids need to see what good will come of learning something. Even as adults, we do what we enjoy and avoid (or complain) about doing what we don't. If I exercise, even though I don't like it, I know that I am healthier for it. Good health will come from my hard work. To a young child, they need to see an immediate positive payoff of the work they are doing. For a task that is fun, the reward is in the doing it. But for a task that is not, there may need to be a positive reinforcement once it is finished and finished well." "Resistant learners are always resistant for a reason. Sometimes that reason takes a little time to figure out. But once you do and begin working to remedy the problem, things can turn around quickly. Potential issues to consider include a learning disability, assignments that are too hard or too easy, assignments that are boring, assignments that don't meet learning styles, assignments that expect too much independence, a lack of consistency in the schedule, a lack of consistency in discipline, too much commotion in the room, or even a feeling of loneliness. Talk to your child and make observations. Then, so your child begins to take ownership of the problem, work with him or her to make the necessary changes." "We have distracted learners in our house who often cause disruptions of some sort. I have found that specific rewards/consequences tailored to each child are good behavior motivators/deterrents. Also being consistent in whatever method you choose is super important (and totally exhausting, I know)." "In my home, my boys are most often my resistant learners. Mostly because they would rather move than be sitting still learning something. Let them move! Short lessons with plenty of breaks. Interesting living books, hands on learning, go with where their interests lie." "Use humor to diffuse some of the resistance. My daughter used to act like math was killing her.Some days I lightened the mood with silly, exaggerated drama. I would say in my most theatrical voice while wiping imaginary tears, 'It was so great having a wonderful daughter for these 9 years. I will miss her. Now she is dead, killed by math. Evil, evil math! I can't believe it's so heartless to take the life of my precious child!' "
"While you're determining the root cause of your child's resistance, remember to be intentional about showing that child love. Working with a resistant learner can be frustrating, but I know my attitude toward this child can help the situation or make it worse. Speak words of life, give extra hugs, and do something fun to help maintain your relationship with your resistant learner during this time!" "When children resist homeschooling, they are revealing something about themselves and actively trying to tell us something. Our job as parents is to figure these clues out. Discovering the root of the resistance -- whether physical, cognitive or behavioral - is key. Only when the true cause of the resistance [is understood] can this situation be properly addressed." "My advice to parents of resistant learners is to shorten the lessons and vary the tasks. Lessons should be short (10 minutes for young children, 30 middle school and 45 for high school). Varying the task means to do something vastly different than the last lesson. For instance, if you do reading, follow it with hands-on art or a nature study. Follow that with math (thinking and logic), and so on. Short lessons and varying the tasks keep the brain alert." "I have a child whose mind gets full of information, so focusing in on one area of learning can be difficult. I think you have to find what works for each child. For me it was letting him hum or sway or tap, because that rhythmic sound or movement let him focus his mind on the task at hand. I know another mom who lets her child hold silly putty while he works. So find what works for your child and realize that sitting in a chair and being quiet may not be the best way for your child to learn." "In my experience, a child who resists learning is often being asked to do work for which he or she is not ready, or the child has developed the habit of resisting school work. First I ensure the material is not too difficult by going back to material that is super easy for the child. Then we practice diligently doing our schoolwork cheerfully everyday until it becomes the new habit." "Assess the situation. There may be several reasons why a child is a reluctant learner. Maybe the program is boring or too easy? Maybe it’s too hard. Assessing the situation can give you the knowledge you need and clear up whether to treat the problem as a learning difficulty, a focus problem, emotional or just plain discipline issues. It's also important to know your child's learning style and teach to it." You might face resistance. But, don't let it define your day or your ability to teach your child well. Remember, a display of dug-in heels is usually just a outward sign of some other issue. As a homeschooling mom, you have the very unique blessing of not only being able to teach to the mind, but also to the heart. Don't be afraid to set the books aside for a while and focus your efforts on building a relationship with your child. Take time to ask questions and be willing to accept honest answers. An open dialogue can usually provide some very helpful insight to a child's struggles. 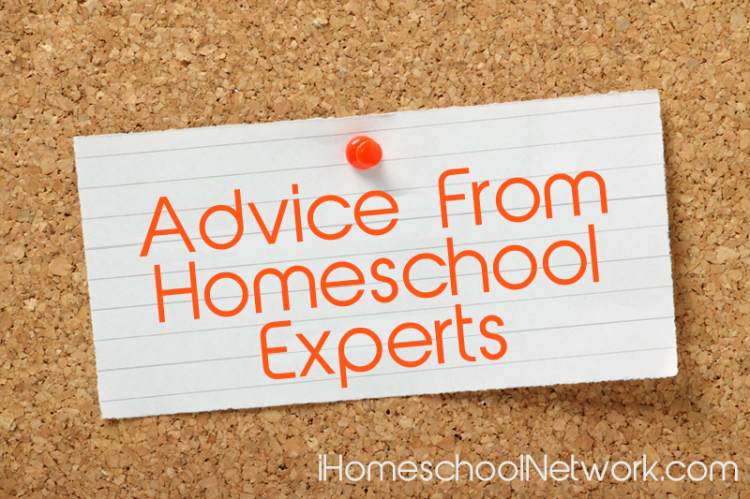 For more advice from some expert homeschool mommas, be sure to visit iHomeschool Network.